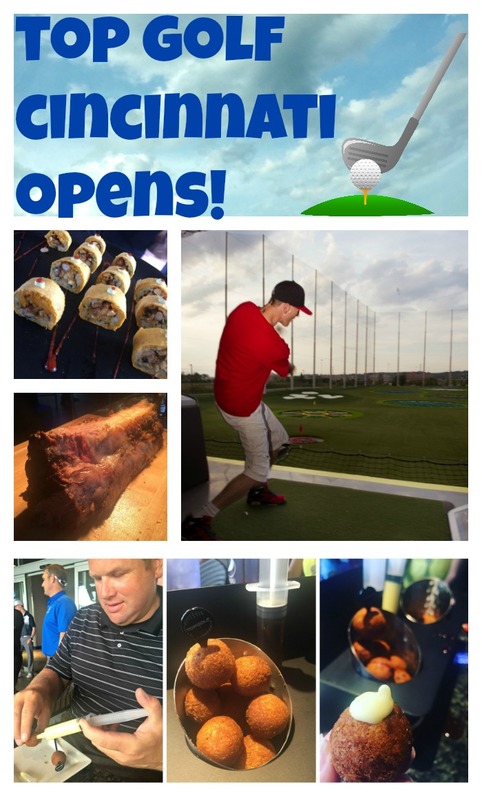 Food Hussy Road Trip: Top Golf Cincinnati | The Food Hussy! 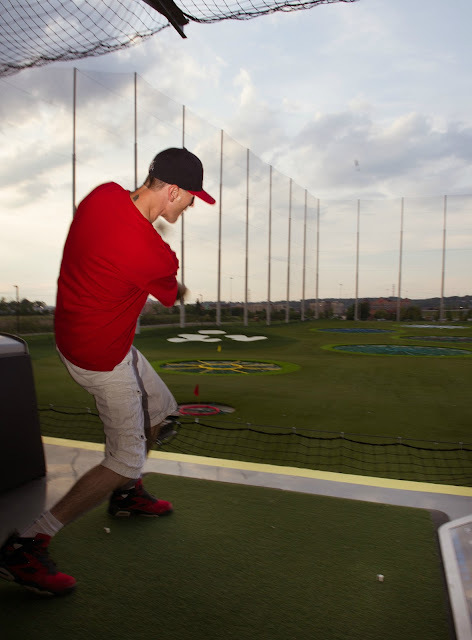 Top Golf invited me for this premier night but all opinions are my own. Recently I was invited to a premier night of Top Golf at their newest location in West Chester off exit 19 on I-75. The quick analogy is combine a giant driving range with bowling computers - it makes a game out of a driving range! They just opened to the public on July 29! Besides getting to try the golfing - which was a blast - we also got to try quite a bit from their menu! I can start out by telling you - it's a whole lotta fun! I would DEFINITELY go back for a fun date night with another couple or a company outing! So keep reading to find out more! First - you may have seen this as you drive by on I-75. It's a GINORMOUS fence! For the longest time I was clueless as to what it was... Once you take the exit - you go towards the movie theater and restaurants and it's all the way to the back - next door to the new Main Event - which has bowling, laser tag, games and more. 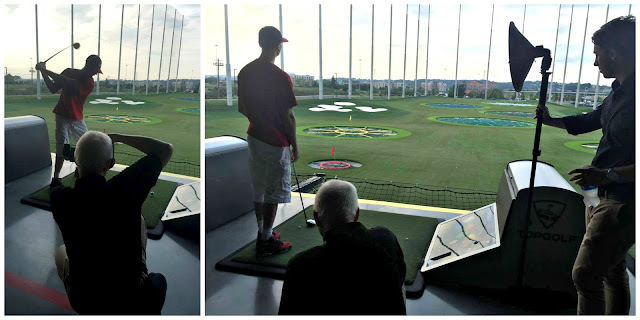 The Top Golf center has quite a setup - and if you're not sure how to get back there - you're not alone! Just wind around until you get to the very back of the development area. Once inside - there's a huge shiny bar area with TVs everywhere and lots of seating - so when this place is PACKED and you're waiting for your golf bay - you can hang out there and watch a game or have a bite (more to come on that!). There were a few of us bloggers in attendance so we hung out together and grabbed a drink - they had a cider on tap and a few drink specialties that we all enjoyed. The bays are wide open so it's really open and airy to look out on the lawn. They offered us appetizers to try - this was a "sushi" - I think it was like a black bean - sort of a Mexican style. It was REALLY good - we all went back for 2nds and 3rds on this! They have a standard menu to order from but also have a their own chefs for catering purposes that can do a wider variety. 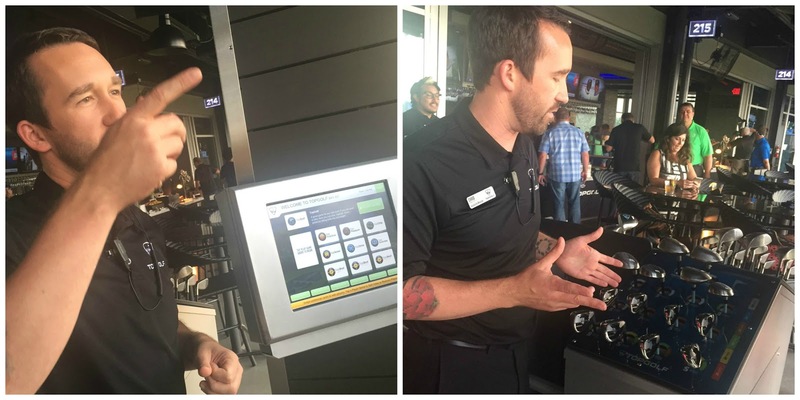 The staff was there to explain the game and show us how to use everything. It's a lot like the computers at a bowling alley. You can have up to 6 people in a "bay" and you go up hit a few balls (3-5 at a time) and then use the touch screen to go to the next person. They also have clubs there for you - a set of mens and womens. It's very dummy proof so if you know NOTHING about golf (me!) then you can just grab a club and go - but you can also bring your own clubs if you would like. So the "course" is enormous! They have huge "holes" out on the course and the balls all have tracking devices in them. First you activate yourself on the screen - then you take your club onto the green and wave it in front of a sensor and a ball pops out. Then you walk up and hit the ball! The geotracking devices in the malls show you where your ball lands and if it goes in hole - how close it was and scores it all for you. There are also different sizes of holes and ones near and far - so all skill levels can enjoy it. One girl in our group had never golfed and she ended up beating the boys! But there was also FOOD! They had quite a buffet set up for us with this giant prime rib - which everybody loved! It was tender and juicy - perfectly cooked. 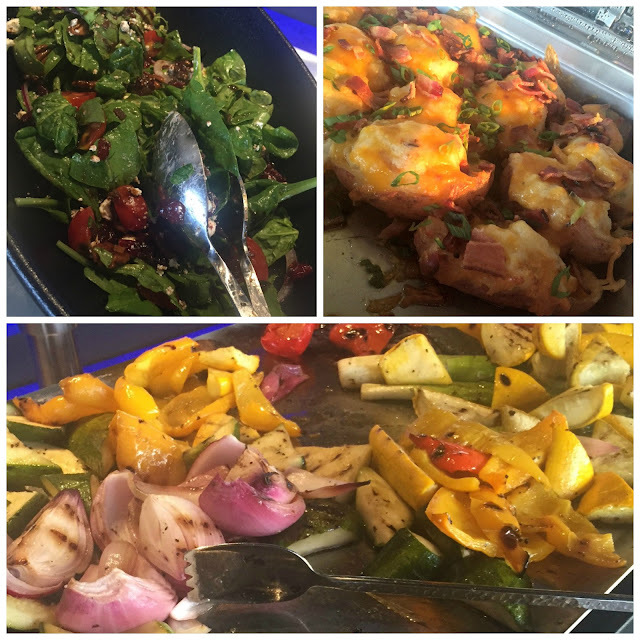 We also had a spinach goat cheese salad, mini loaded baked potatoes, grilled veggies and more. Everything was really good - everyone said the same thing - there wasn't one misstep in terms of food. It also didn't taste like "bar food" or your standard catering. One of my favorites was the seared ahi tuna - it was perfectly cooked and very light with little crispy elements and a creamy aioli sauce on top. I ate mine and Larry's! 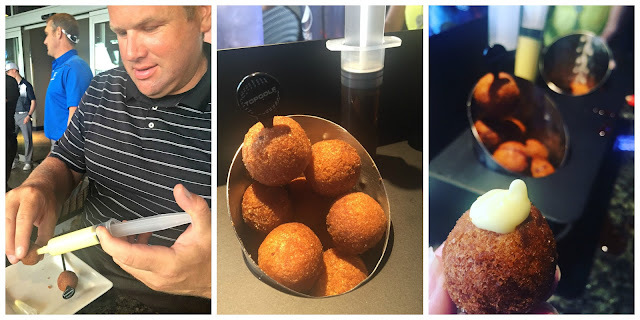 For dessert they brought us out something special - their housemade donuts with injectable fillings! Dan tried them out for us first - there was a chocolate sauce and a vanilla creme. Word of caution - the chocolate is basically chocolate sauce and 3 of us didn't realize how runny it was and it went EVERYWHERE! That said - put the plunger IN the donut and push gently. They were really tasty and fun. Downstairs in the complex there is a pool table and video game set up if you're waiting for your bay as well. There are 4 levels (I think) so there are lots of spots open but I'm sure they go fast on weekends. And - unfortunately - there was one shot of me! So I'll also tell you a little about the pricing. You can have up to 6 people in a "bay" - so it's perfect for a date night or a night out with kids. There is a "membership" of $5 that gets you free clubs and is good for a lifetime. Then you pay hourly for the bay - rates vary from $25-$45/hour depending on the time of day you go. All in a all - we had a really great time! I immediately came back and told my bosses we should go for a company outing! So if you're looking for a fun night out - definitely check out Top Golf! We will definitely be back!